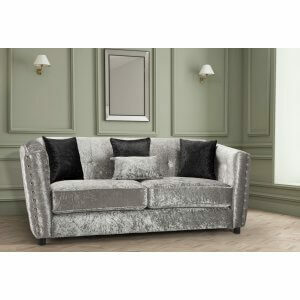 Silver crushed velvet 3 seat sofa • Soft foam padded seating and decorative scatter cushions. • Crushed velvet style polyester fabric. • Glitz and glamour. • Hard wood frame. 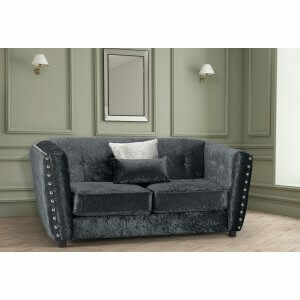 Black crushed velvet 3 seat sofa • Soft foam padded seating and decorative scatter cushions. • Crushed velvet style polyester fabric. • Glitz and glamour. • Hard wood frame. 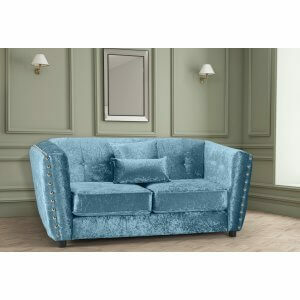 Aqua Blue crushed velvet 3 seat sofa • Soft foam padded seating and decorative scatter cushions. • Crushed velvet style polyester fabric. • Glitz and glamour. • Hard wood frame. Denim Blue crushed velvet 3 seat sofa • Soft foam padded seating and decorative scatter cushions. • Crushed velvet style polyester fabric. • Glitz and glamour. • Hard wood frame. Cream crushed velvet 3 seat sofa • Soft foam padded seating and decorative scatter cushions. • Crushed velvet style polyester fabric. • Glitz and glamour. • Hard wood frame. Gold crushed velvet 3 seat sofa • Soft foam padded seating and decorative scatter cushions. • Crushed velvet style polyester fabric. • Glitz and glamour. • Hard wood frame. Lavender crushed velvet 3 seat sofa • Soft foam padded seating and decorative scatter cushions. • Crushed velvet style polyester fabric. • Glitz and glamour. • Hard wood frame. Mink crushed velvet 3 seat sofa • Soft foam padded seating and decorative scatter cushions. • Crushed velvet style polyester fabric. • Glitz and glamour. • Hard wood frame. 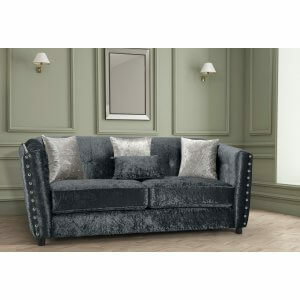 Mulberry crushed velvet 3 seat sofa • Soft foam padded seating and decorative scatter cushions. • Crushed velvet style polyester fabric. • Glitz and glamour. • Hard wood frame. 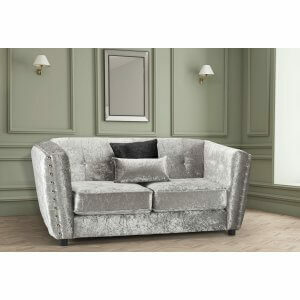 Silver crushed velvet 2 seat sofa • Soft foam padded seating and decorative scatter cushions. • Crushed velvet style polyester fabric. • Glitz and glamour. • Hard wood frame. 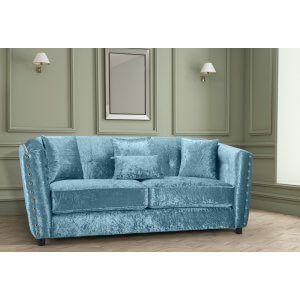 Aqua Blue crushed velvet 2 seat sofa • Soft foam padded seating and decorative scatter cushions. • Crushed velvet style polyester fabric. • Glitz and glamour. • Hard wood frame. Denim Blue crushed velvet 2 seat sofa • Soft foam padded seating and decorative scatter cushions. • Crushed velvet style polyester fabric. • Glitz and glamour. • Hard wood frame. Cream crushed velvet 2 seat sofa • Soft foam padded seating and decorative scatter cushions. • Crushed velvet style polyester fabric. • Glitz and glamour. • Hard wood frame. Gold crushed velvet 2 seat sofa • Soft foam padded seating and decorative scatter cushions. • Crushed velvet style polyester fabric. • Glitz and glamour. • Hard wood frame. Lavender crushed velvet 2 seat sofa • Soft foam padded seating and decorative scatter cushions. • Crushed velvet style polyester fabric. • Glitz and glamour. • Hard wood frame. 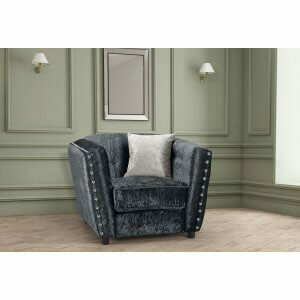 Mink crushed velvet 2 seat sofa • Soft foam padded seating and decorative scatter cushions. • Crushed velvet style polyester fabric. • Glitz and glamour. • Hard wood frame. 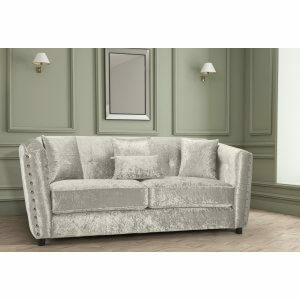 Mulberry crushed velvet 2 seat sofa • Soft foam padded seating and decorative scatter cushions. 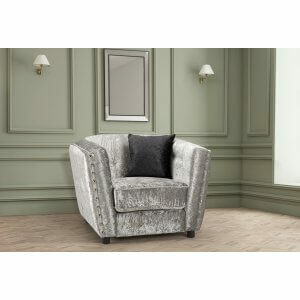 • Crushed velvet style polyester fabric. • Glitz and glamour. • Hard wood frame.